This is the second article in a series addressing diversity issues in Silicon Valley and Corporate America. This series explores solutions and best practices for increasing diversity in the workplace. Click here to read our first article on "homogeniuses" and the case for diversity and inclusion in the tech industry. Silicon Valley is particularly infamous for being populated by homogeniuses (highly intelligent people who look alike and come from similar backgrounds). It is high time that tech companies started realizing the value of investing in a diverse and talented workforce. Failure to understand the business case for diversity can come at a costly price. Uber and its leaders' fall from grace exemplify this. Once in the limelight for being a "market disruptor," Uber is the poster child for how ignoring toxic work cultures—blind to diversity issues—can bring down leaders at the top and tarnish a company's image. 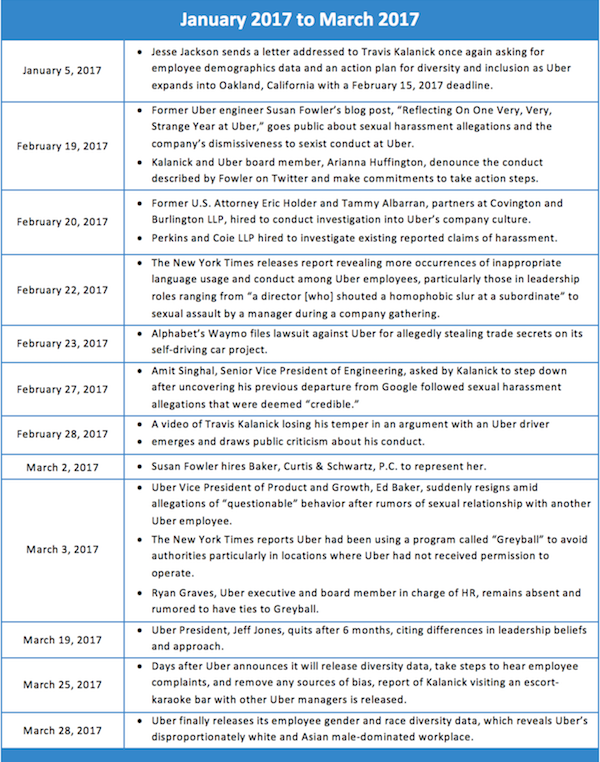 Uber's downward spiral started with a blog post by a former employee, Susan Fowler, claiming dismissive responses to sexual harassment allegations, prevalent sexist attitudes, and inappropriate workplace conduct. This snowballed into an investigation of the company's uncurbed "bro-culture," prompting the firings of many high-level executives-culminating in the ousting of the CEO and founder, Travis Kalanick. The risks of staying with the current business model that relegates diversity to less than an afterthought are too costly to ignore. Not only are diverse companies more profitable and return better value for shareholders, but a company with a toxic and homogenous workplace lacking basic protocols around harassment and human resource procedures creates a hotbed for lawsuits. Establishing an inclusive workplace all the way to the top can be key to not only improving company performance but also avoiding public relations disasters and consumer backlash. How can your company avoid becoming embroiled in endless scandals and being Silicon Valley's next featured cautionary tale? What should you keep in mind when evaluating the adequacy of your company's commitment to diversity and inclusion? How can you strategically leverage diversity's upside, so it adds value to your company? 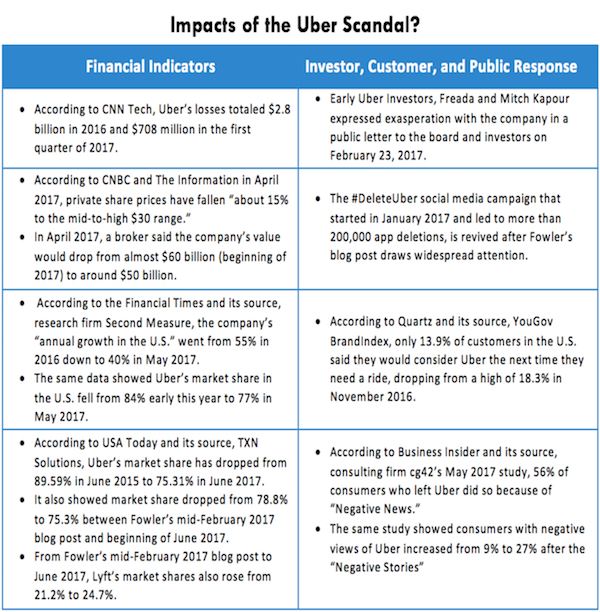 Fowler's February 2017 blog accelerated but did not initiate Uber's current leadership and public relations crisis. The fuse was lit well before 2014, and the issues fully exploded in 2017. Once under the public's relentlessly watchful eye of intense scrutiny, almost any Uber misstep—related to diversity or questionable business practices— became a scandal that reached as high as the upper echelons of Uber's management. Nearly six months of nonstop negative press has not helped Uber. Although the company's financial state cannot be definitively attributed to the scandals, it is difficult to see how there have not been negative financial impacts. The responses from the public and investors have been sobering for the company. The collective impact of Uber's company culture, diversity blindness, leadership challenges, and business practices is clear. Uber has left money on the table in the form of lost customers and reduced market share. Companies at every stage of growth and development should weigh the possible consequences of a myopic approach that ignores the business case for diversity—especially those looking to pursue an initial public offering like Uber. Bad press will hurt your popularity and reduce your customer base. This turn may impact your company's long-term ability to attract and retain investors and customers. Fostering a diverse and inclusive workplace becomes important for a company's bottom line and should be built into the backbone of every company's policies and culture. Incorporating diversity into a company's business practices and operational culture yields financial returns while creating more welcoming workplaces for top talent. According to a McKinsey report, companies that were ranked at the top for racial diversity were 35% more likely to outperform those ranked at the bottom. Those at the top for gender diversity were 15% more likely to outperform those ranked at the bottom. Another McKinsey study showed that returns on equity were 53% higher for companies with greater executive board diversity. When diversity is not part of a company's foundation, it may suffer painful consequences. This rings resoundingly true for Uber, as evidenced by recent events. Uber did not do itself any favors by having a homogeneous workplace as its starting point. Its long-awaited employee data hint things were already headed in the wrong direction. There is a troublingly low number of female (15.4%), black (1.0%), and Latino (2.1%) employees in the company's tech roles. Uber is dominated by whites (46.2%), Asians (44%), and men (63%). In positions of leadership, there are virtually no blacks or Latinos in tech-related roles, and only 11.3% of women. This points to Uber's management issues. Diversifying its ranks, arguably, could have helped prevent Uber's current woes. However, the industry as a whole is struggling. 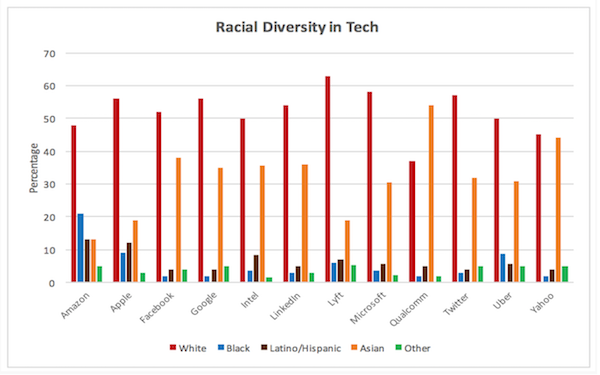 Bloomberg Technology pointed out that Uber's diversity report does not capture the full story or extent of its or the tech industry's problem because there is no mention of retention rates. That piece of information is a key factor in determining the effectiveness of policies around diversity and the status of company culture. Uber's employee demographics are not singularly embarrassing. 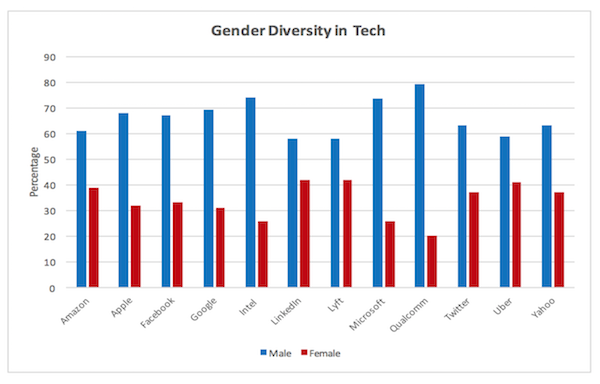 The rest of the tech industry shares its shameful reality when it comes to the lack of progress in advancing diversity. Uber's competitor, Lyft, is not doing much better. The number of employees from underrepresented groups is consistently poor even for major and long-established companies like Apple, Facebook, and Google. These companies have started implementing diversity and inclusion initiatives, but have a long way to go to move the needle. They could be more strategic in driving results. Uber's Fix—Is There a Solution? 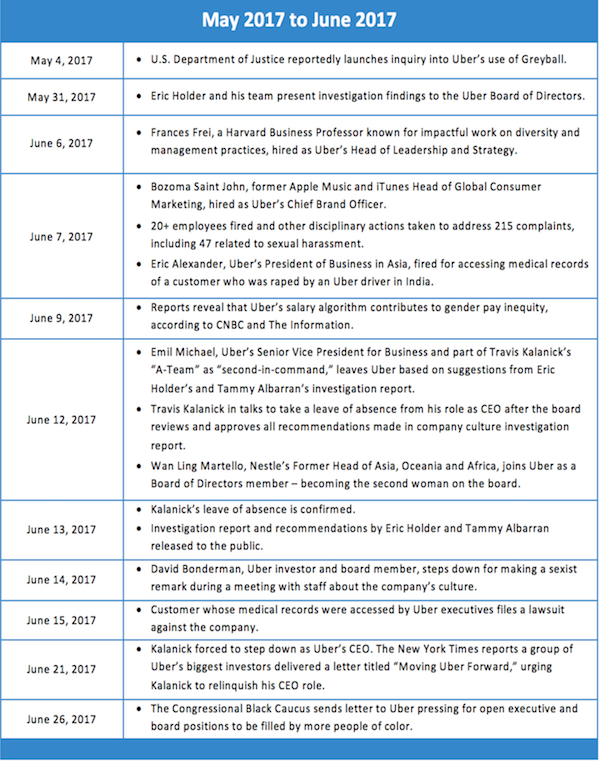 On June 13, 2017, after months of an extensive investigation, Eric Holder, Uber's outside legal counsel, released a list of recommendations for the company. It removed any lingering doubts that there is a need for change. Uber's board unanimously voted to implement all of them. 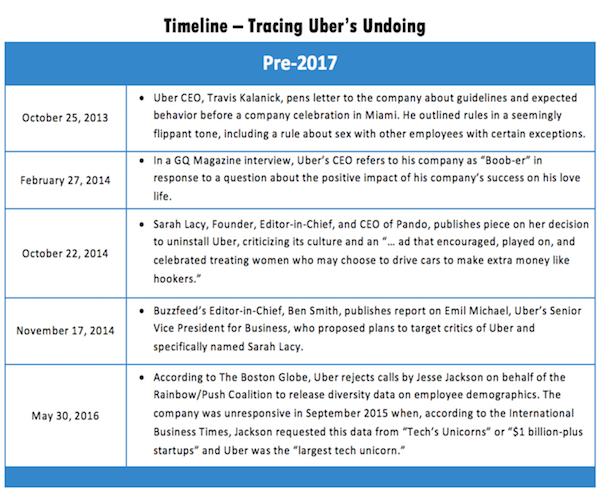 This chart shows how basic protocols were lacking, which is a major source of Uber's many problems. Holder's recommendations outline fundamental changes and rudimentary policies that should be enacted in any company. The fact that these were not in place shows how far Uber will need to go to solve its leadership and diversity challenges. This is just the beginning and a first step. Holder's recommendations scratch the surface and need to go deeper. Diagnosing the more ingrained diversity issues that Uber faces require looking at all aspects of its business, starting with its leaders and human resources professionals. Key leaders and departments were unprepared and ill-equipped to handle gross employee misconduct and fostered a work environment that excused it. This problem cultural that also plagues much of the tech industry. 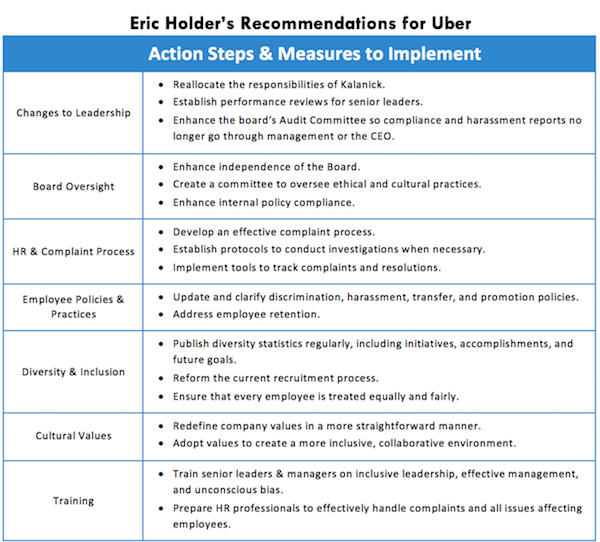 Eric Holder's recommendations lay out a framework that can put any company on the right path, but it is only a starting point. Companies often claim the importance of diversity and inclusion but fall short when it comes to following through with effective strategies. They may talk the talk, but often, drop the ball in implementing solutions and allocating the right resources to drive change in significant ways. The key is to craft concrete and comprehensive solutions that are targeted and sustainable in the long run. Diversity should be treated like any other business problem. Do not wait until a scandal hits your company to start putting together an action plan that creates and maintains a diverse and inclusive workplace. Avoid making Uber's mistakes. Does your company's leadership demonstrate the importance of diversity through their actions? Does your company promote inclusive teamwork? Does your company culture ensure everyone—especially those from underrepresented groups—feel respected so they can work at their highest capacity and want to stay? With any approach to diversity, you need to consider these points when designing a long-term strategy. Define what "diversity" means for your organization and who you should be targeting with your initiatives. Develop a robust and long-term diversity strategy. Assess your internal barriers so you can begin to address them. Allocate adequate human capital and financial resources for implementing diversity strategies. Hire diverse employees all the way to the top—including senior leaders, top executives, and on your board. Actively create programs addressing recruiting, promotion, and retention of diverse employees. Evaluate diversity across and within teams, working groups, divisions, and key company projects and accounts. By laying the foundation with a lens towards these suggestions, you can help create core values that attract top talent and create an inclusive workplace. For any diversity strategy to be sustainable and effective in building an inclusive workplace culture, all leaders and employees must be held accountable in implementing and enforcing it. This helps to make sure inclusive workplace practices permeate through all levels of your organization. Hold the CEO and board accountable for diversity metrics and their behavior. Provide business incentives supporting diversity. Incorporate diversity benchmarks in performance reviews for senior and mid-level managers, and link them to bonuses and promotions. Solicit confidential feedback on diversity from all employees about leadership and management—possibly incorporating feedback into individual performance reviews. Create internal mechanisms for employees to report on diversity (e.g., surveys, confidential complaint processes, and committees)—linked to a broader approach that responds to feedback through implementing action steps and solutions. Publish diversity metrics externally, making them available to the public, and include diversity reporting in quarterly board and annual shareholder meetings. Building a team culture also means building an extensive system of accountability for all employees. Tie positive behavior with positive incentives for employees and managers and prevent inappropriate behavior by making clear consequences for actions that do not mesh with your values. Without a robust infrastructure, your efforts to create a positive culture with high levels of accountability can only be so effective. Do you have the policies and business structure to support diversity and inclusion efforts? Have you implemented enough oversight of your leadership? Establish leadership roles and teams focused on diversity and inclusion—going beyond human resources—by embedding diversity officers in business functions. Create and enforce policies and protocols around acceptable behavior. 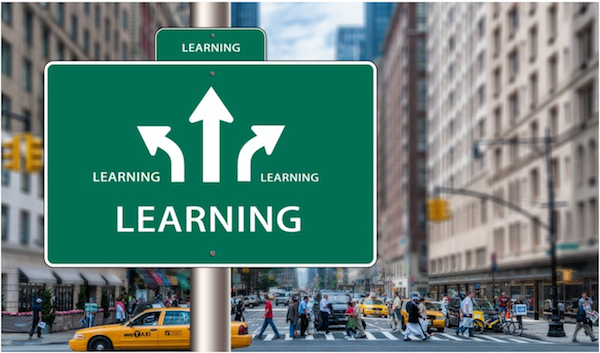 Incorporate diversity into company training—going beyond "diversity" and "unconscious bias" training by including it in standard business and leadership training. Expand talent pipelines to include more diverse candidates, and overhaul hiring practices to ensure diverse candidates reach the interviewing stage in the recruiting processes. Conduct an annual diversity audit, evaluating the results to develop improvements and implement changes. All companies should maintain the right infrastructure with appropriate oversight. When a company is in the start-up phase, it should not neglect the need for infrastructure, but rather establish protocols and structure early. Policies need to be consistently enforced so that even the "high performing" employees and managers working under you do not jeopardize your company's future and promote toxic cultural practices. At the end of the day, people needed to feel welcome and included at work so they can effectively drive results for the company. Innovative companies have true potential to create new ways of living and working, and Silicon Valley has developed a new and pioneering technology. The time has come for tech companies to evolve and go through its internal revolution. The turmoil that Uber faces and the uncertain future of the company and its leadership should open up the eyes of every leader in the tech industry where homogeneity reigns. These lessons on inclusive culture changes, however, apply to any industry. Any businesses' success is hinged on its culture and how it truly values diversity. Diversity should not be an afterthought or side project for the few brown faces and women roaming the halls of your company. It should be a way of doing business. Efforts to fix damaged cultures at Uber and other companies should be commended, but the tech sector is in its infancy of addressing this issue. The Azara Group can help you grow as a leader, and advise you on the proper changes and effective business approaches your company can take to integrate diversity and inclusion to improve your bottom line. For our advice on homogeniuses in the tech industry, check out the first article in this series.